Medicare and state regulation requires that five percent of all patient care services be provided by volunteers. This requirement, as well as Homeland Hospice’s commitment, elevates volunteers to be an integral part of the team serving our patients and families, and as well in supporting the administrative work which keeps the organization functional. Homeland Hospice is seeking caring, compassionate individuals who are interested in giving to others, and in return being blessed abundantly, by sharing time with those who are at end of life and their families throughout south central Pennsylvania. Volunteers are needed in each community of our 13 county service area. We are growing, and our commitment to our community is to provide quality care, supported by quality staff and volunteers. 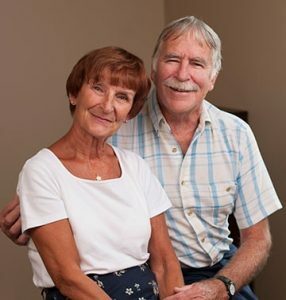 Sherry and Andy bring the perspective of caring for loved ones at the end of their lives and finding comfort and support through Homeland Hospice. “Helping people who are at the end of their lives makes you forget about your own aches and pains and problems,” says Sherry. “It’s hard to be…” She pauses, looking for the word. “Sorry for yourself when you see the condition of someone else,” says Andy, completing the sentence. You can volunteer now, or download a volunteer application. Our training program is done in two ways. Training can done online, on your schedule, with organizational support throughout the process. Or, classes are made available throughout the year in varying locations—this is a six week program. Your volunteering time can be as flexible as you need it to be. As a volunteer, you will be offered continuing education opportunities, quarterly focus groups, and ongoing contact from the Coordinator of Volunteers or other members of the Homeland Hospice team. For more information, email Laurie Murry, Coordinator of Volunteers, or call at 717-221-7890.